I thought I’d try the notched spreader fairing technique to try evening out those newbie splices I was mentioning last week. This should allow me to (more) quickly build up either side of the high spot. For anyone not familiar with this technique, the idea is to apply a layer of fairing material with a notched spreader or trowel. 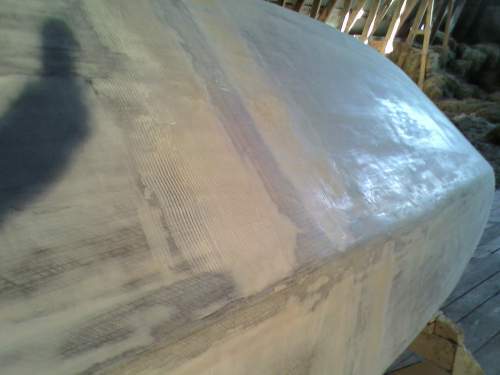 The ridges are then sanded fair and filled in with another coating of fairing material. While not the most sparing way to apply Quickfair I think it’s going to save me the painstaking process of building layer upon layer. I was inspired to try out this technique after reading a recent post from Ed on his Building the F-22 blog. Thanks Ed! Overall, the fairing seems to be coming along. There are sections, such as aft of the ridges, that are starting to look almost even. Depending through which window the sun is shining into the hayloft. (No, I’m not flipping the bird in that first photo – it’s cell phone shadow). Be carefull with that method. 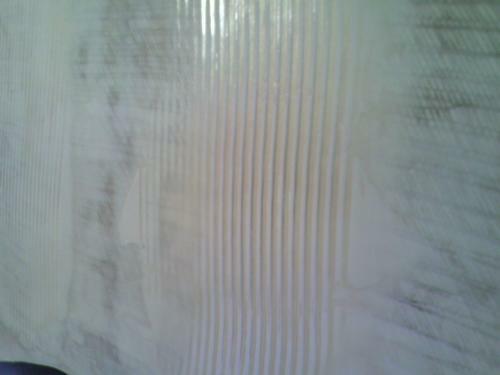 The second application of bog does not bond well inside the grooves of the first application. I have seen old cedar strip F-9 floats done that way that had to be redone after a few years. Anyone else with better experience?